Chickenpox is a very contagious infection that is caused by the varicella-zoster virus. The infection causes a very itchy, blistery rash all over a person’s body. Routine vaccination against the varicella virus has significantly decreased the number of cases of the chickenpox we see each year. Prior to the vaccine, it wasn’t abnormal for everyone to have been infected with the virus sometime before adulthood. How is the chickenpox spread? Being that the chickenpox is so contagious, the virus is easily spread from one person to another through the air or through direct contact with a person who is infected with the virus. When an infected person talks, coughs, or sneezes the droplets of saliva get expelled into the air, and are easily picked up by others around them. It can also spread by coming into contact or touching the characteristic blisters of someone infected. Alternately a pregnant woman can pass the infection onto their baby before birth. A person is able to spread the infection a day or two before the rash appears, and they remain infectious and can spread the infection up to the time when the rash blisters have formed scabs. There is a period of time between being exposed to the infection and showing signs and symptoms of the infection. This is called the incubation period, and it typically lasts anywhere from 10 to 21 days. Once someone has had the chickenpox, they cannot contract the infection again. In a very small number of cases, a person can get the chickenpox more than once, but this is very, very rare. What are the symptoms of the chickenpox? Like many other viruses, the signs and symptoms of the chickenpox may be similar, but the telltale sign of the chickenpox is the rash. The red spots begin on the face, and spread to the chest, back and rest of the body. You may even see the rash inside the mouth, on the eyelids, or around the genital area. The spots become extremely itchy, and begin to form blisters, or vesicles, that are filled with a clear fluid. These fluid filled blisters will break open, usually from the itchy, and then eventually they will form a crust and scab over. After the rash appears, the infection usually sticks around for about 5 to 10 days. How is the chickenpox diagnosed? 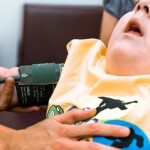 When seeing your doctor or nurse practitioner they will examine your child looking for the above signs and symptoms. They will perform a physical exam and take a history including information about possible exposure to someone who is infected with the chickenpox. 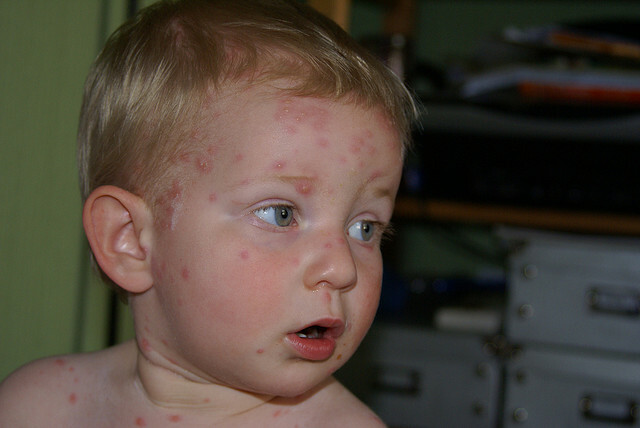 The telltale rash is often enough to make a diagnosis of the chickenpox. If there is any question as to the diagnosis, further testing may be ordered, such as a blood test, or a culture of the fluid from the blisters. Is there treatment for the chickenpox? The best protection from the chickenpox is ensuring your vaccinations are up to date. The chickenpox vaccine is given twice during childhood. The first dose is given between 12-15 months, and the second dose is given between 4-6 years old. The vaccine is about 98% effective at preventing the chickenpox and it helps to protect yourself, as well as others in the community who cannot get the vaccine, like those who have weakened immune systems from illness such as leukemia, as well as pregnant women. (Click here for the immunization schedule). Calamine lotion and oatmeal baths can help to relieve the itching blisters (avoid hot baths). Keeping your child’s fingernails short to try and prevent breaking the blisters. Covering the hands with gloves or socks to prevent scratching and to prevent infection. Keep your child’s skin clean, and make sure to keep the blisters clean to prevent infection. 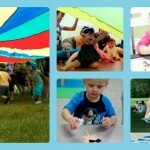 Dress your child in light-weight clothing to keep the skin cool. If your child feels well, allow them to play, this will help to take their minds off of itching. Keep your child well hydrated with water. Keep your house and toys clean to help prevent the spread of the chickenpox. 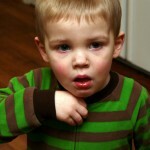 Acetaminophen (Tylenol) or ibuprofen (Advil, Motrin) to reduce the fever. Do NOT give your child aspirin or aspirin containing products. Be sure to avoid aspirin in adults with the chickenpox also. Since your child is so infectious, it is best to keep them home from school or daycare while they are sick, and they can return once the blisters of the rash scab over. Are there complications of the chickenpox? For those who have had the chickenpox infection, you may be at risk of developing shingles. Shingles is caused by the same virus that causes the chickenpox. After you have the chickenpox, the virus stays dormant, or hidden, in your nerve cells and can become reactivated later in your life causing shingles. Shingles is a very painful blistery rash that forms in patches of the body. It is more likely to appear in the elderly and those with weakened immune systems. There is now a vaccine available for those aged 60 or older who have had the chickenpox to help prevent the shingles. When should I see my doctor or nurse practitioner? If you suspect your child has the chickenpox or has been exposed to someone with the chickenpox, best to make an appointment with your doctor or nurse practitioner. These could be signs of complications of the chickenpox and your child needs to be assessed right away.